This year's selection of pumpkins are ready to be gutted. So, how was your Halloween? 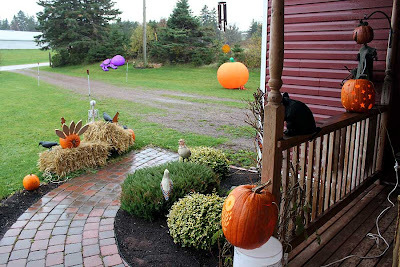 After a whole month of planning and decorating we had rain at just the wrong time. It started in mid-afternoon and continued all night. Not that it was really coming down hard, just a fine continuous mist. I'm not really sure if it was factor or not but we only had three groups of trick-or-treaters for a total of eight kids. They all came by car so I'm sure that they didn't get too wet. It was a bit anticlimactic for us though. We were prepared for about twenty or so and now we have all this leftover candy and chips sitting around the house. Who do you suppose will have to eat it all? Our Halloween display in all its glory! We didn't need the kids, we had fun anyway. Hubby was on vacation the week of Halloween so he was able to get all the pumpkins gutted the day before and they had a chance to warm up before carving time. I hate working on them if they have just come in from outside. Brrrrr! 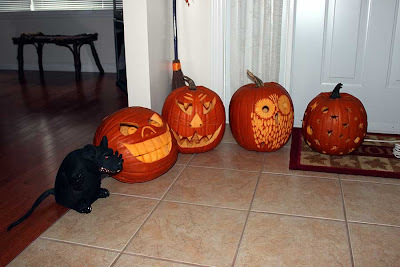 We carved five pumpkins this year. I did my traditional "Miss Kitty" and he did an owl, a spider face, a toothy guy and the moons and stars. They took a long time but it was worth the effort. Miss Kitty was the most talked about again this year. 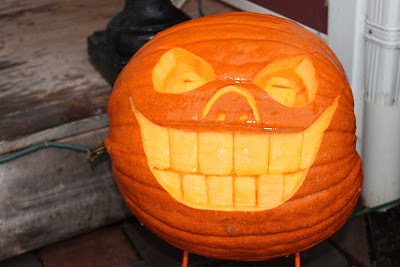 Poor Hubby, some day he will carve a pumpkin the kiddies like. The pumpkin seeds were nice and plump. They made great Devil Seeds! 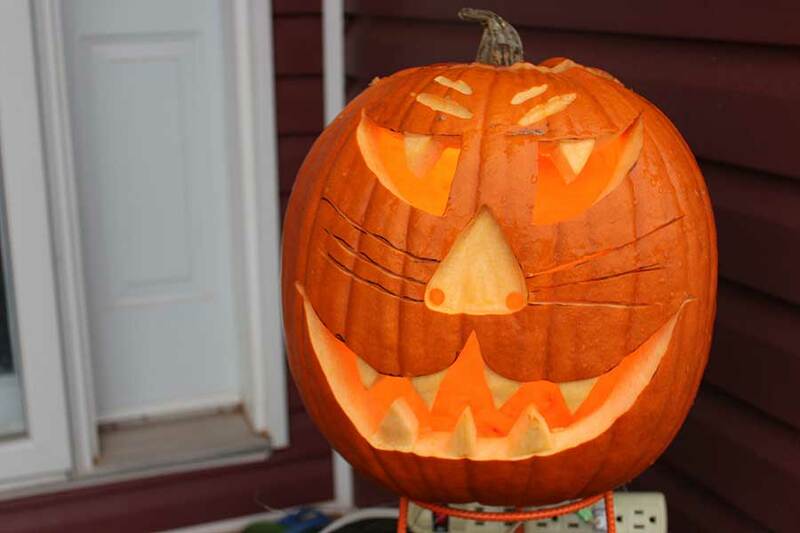 The "October" woodcraft got finished the day before Halloween. 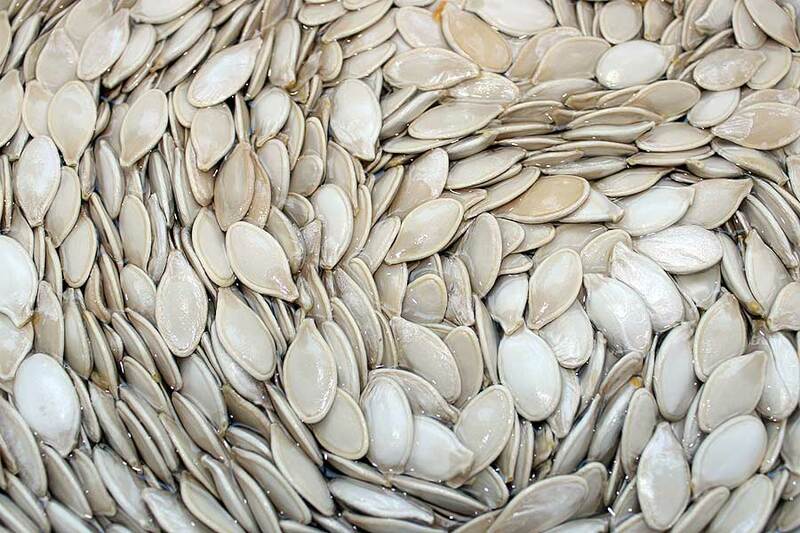 One thing that we appreciated this year was the size of the pumpkin seeds. They seemed to be extra plump for some reason. 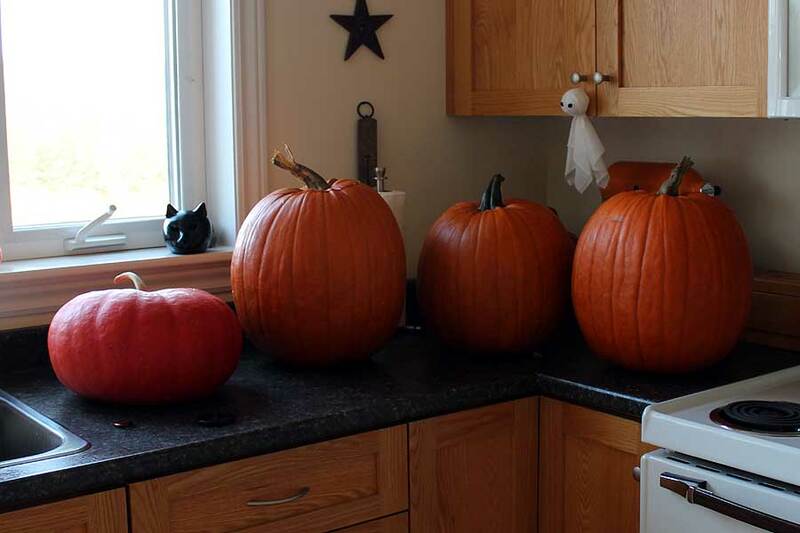 Maybe the pumpkins were a new variety or maybe it was due to the hot dry summer but the seeds were nice and fat. They made great Devil Seeds. I'll probably be eating them until Christmas! We've been busy in the craft room again lately. 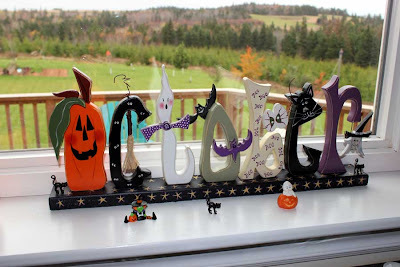 Hubby made this cute October sign from a design we found on the net. It turned out pretty nicely but it was almost November before it got finished. I'll give it another week or so until I pack it away for next year. I'll leave you with a few more pictures of this year's crew. Bye for now. Almost ready to go outside for their début. 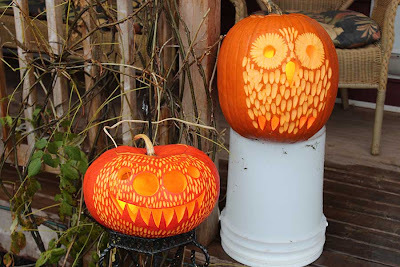 "Spider Face" and "The Owl"
Okay, now let's have some kiddies! Thanks, fellas. You did a great job! Glowing together for the last time. In the sunshine the next day. I thought of you on Hallowe'en and wondered what lovely decorations and goody bags you had. I had only two kids last year and got busy with work stuff this year and forgot to turn on my front light (sign to all trick-or-treaters that i wished to participate). By the time i realised i'd forgotten the light, it was too late. Sadly we had NO kids once again this year. Can you imagine how much candy I've eaten?! 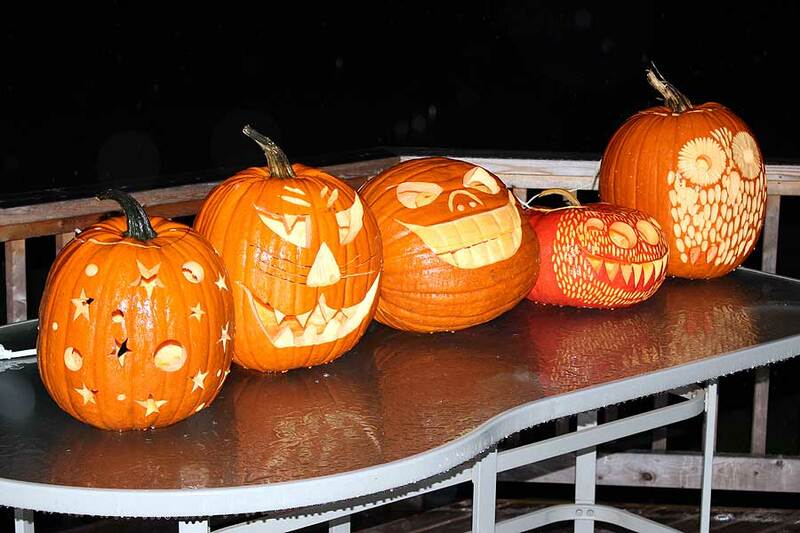 Love love love the line up of pumpkins. How creative you guys are. Really liked the owl myself. Did you grow your own or buy the pumpkins? I can't imagine Halloween without any trick-or-treaters, so sad. 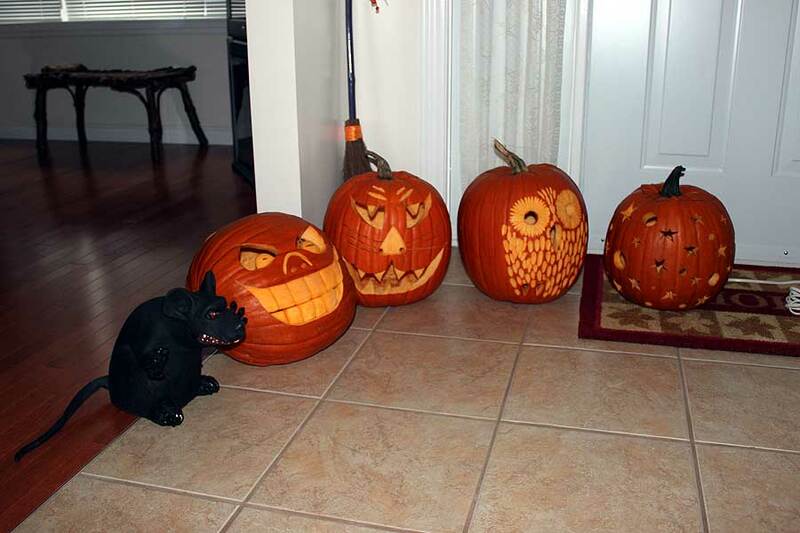 It's funny you should ask about the pumpkins. We did grow our own this year. In fact, like a lot of the garden this year, the pumpkin patch was the best we have ever had. 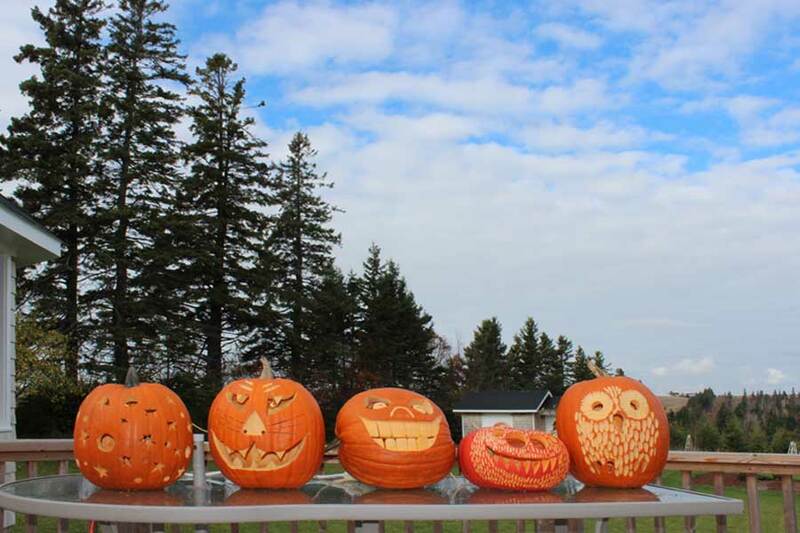 We harvested ten really nice pumpkins but they were all smaller than we wanted. You can see them in the pictures of the house. Just about anything that didn't get carved was one of ours. 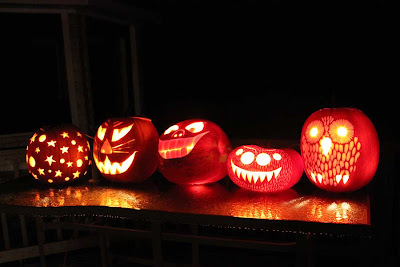 All the one ones that got turned into jack-o-lanterns were bought including the ones with the pumpkin pokers. 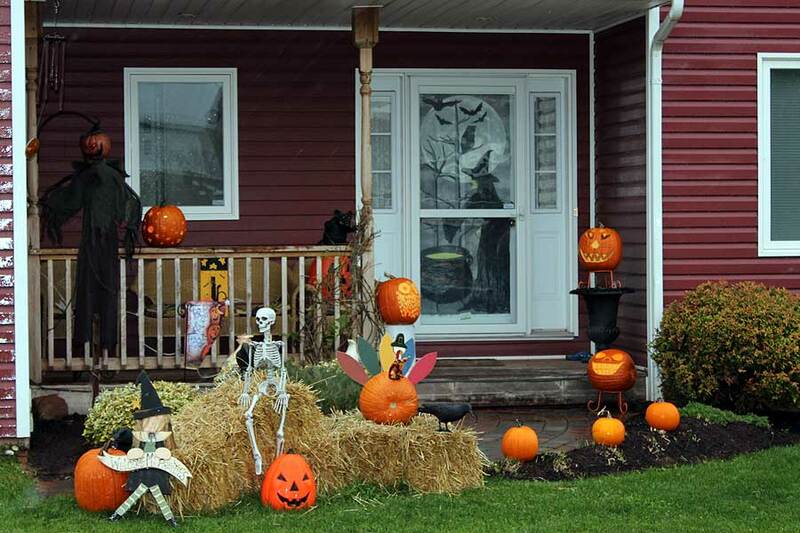 Your Halloween set up looks amazing! Sorry you had so few show up. You remind me of my parents when they lived in a rural area - the kids would come by car, and few of them. Brings back memories of being driven along our road when we were kids, on Halloween night. Hope you managed to get rid of the extra goodies!